Closing isn’t scheduled until April 19, and we probably won’t move in until mid to late May, but hey, I figured I might as well get started. Â I’m always amazed by how many boxes it takes to move anything – that bookshelf in the back filled eight boxes and still isn’t quite empty! That, m’dears, is 175+ lbs of yarn plus a few tubs of patterns, cloth, and miscellaneous surface design tools…stacked three giant tubs wide by five high, with a bit of space on the top for finished projects (Kodachrome is hiding in that unassuming white box) and giant cones of chenille. 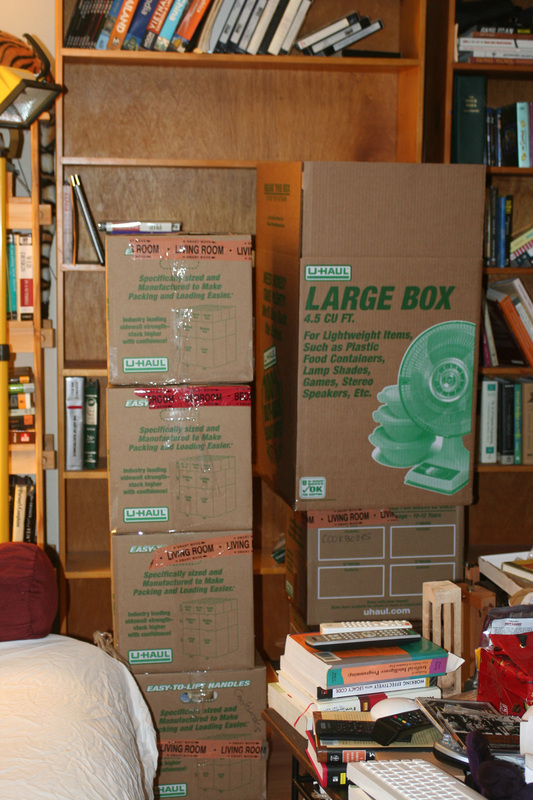 It will take some reprocessing, of course, to be able to actually close all those boxes, but that shouldn’t take long. Â And, unlike the books, I’ve already culled the stash, so no need to go through them again. 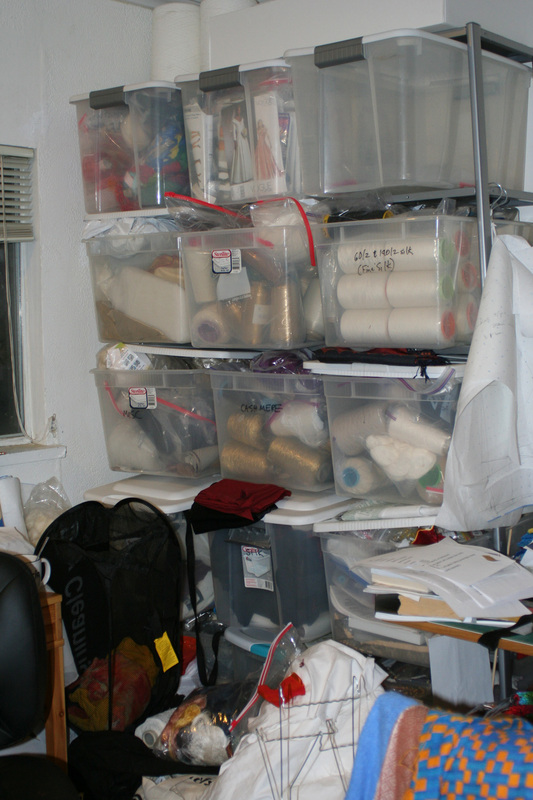 What I’m really not looking forward to is packing up the dye studio – which has tons of breakable glass jars, odd-size dyepots, etc. Â I may move them myself, rather than trying to get it packed well enough for the movers. But moving day is 6-8 weeks out…so there will be plenty of time. Â I’m just trying to get a jump on things. Most of my stash also lives in plastic totes, but I’m still looking for a rack that they can live on. Where did you get your rack?? I don’t remember where I got that particular rack, but I’ve done really well with adjustable racks from Home Depot and the like. This rack is a bit flimsy; I may replace it with one of those Home Depot “would outlast armageddon” racks. Just make sure to measure it first to make sure the boxes will fit! !